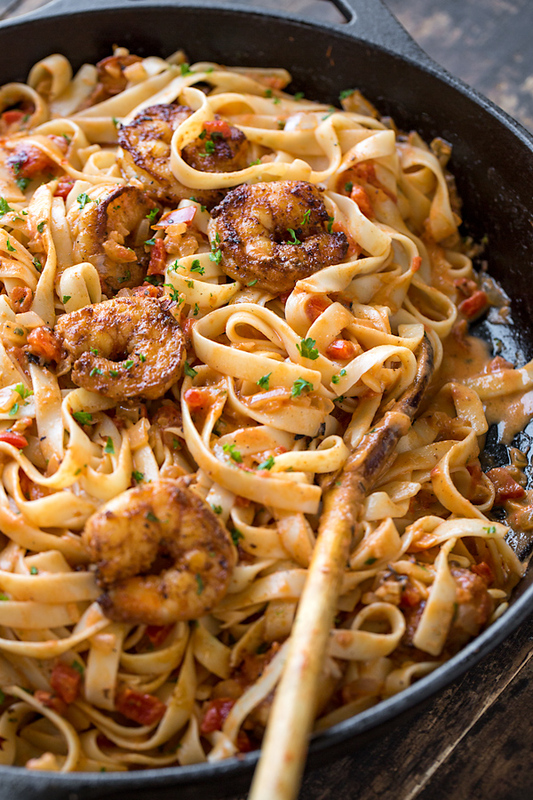 Mildly spicy and wonderfully creamy, this cajun shrimp pasta is a delicious and flavorful restaurant-quality pasta dish to whip up, ready in a flash! I’m definitely a sucker for a spicy pasta dish, and utterly love a spicy pasta dish topped with spicy shrimp! 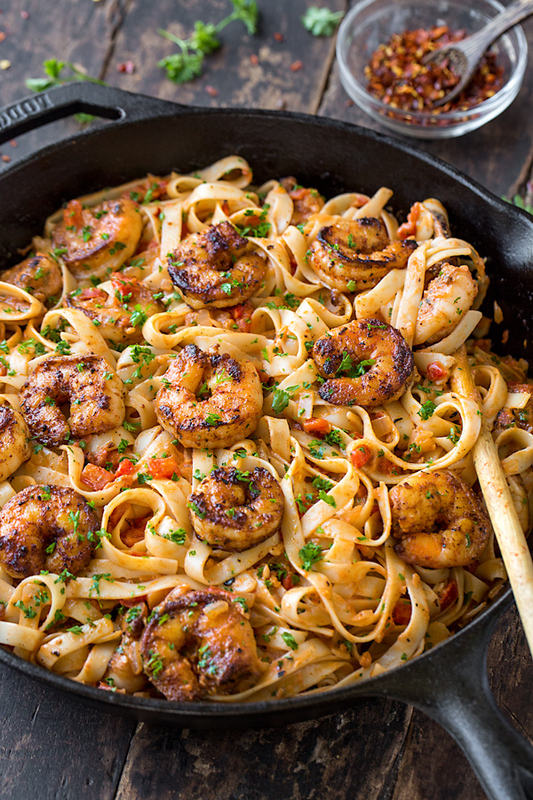 So when I got a hankering to create a new rich and delicious fettuccine pasta recipe recently, I imagined it nice and slick with a creamy roasted red pepper and tomato sauce, and intertwined with some creole-seasoned cajun shrimp, seared and slightly blackened in a hot cast-iron skillet. The thought of that made my mouth water! 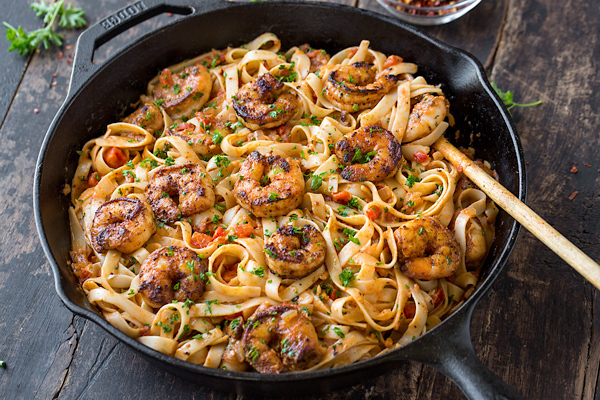 So I got to cookin’, and came up with this delicious and easy cajun shrimp pasta dish with just enough “kick” that you can taste it, but not enough to knock your socks off. This pasta recipe is a little bit spicy and a little creamy, with that wonderful balance between savory and a hint of sweet! I love it when the list of ingredients for a pasta recipe isn’t a mile long. When the ingredients are full of flavor and pack a good punch, you don’t need too many! Naturally, shrimp is the star ingredient in this cajun shrimp pasta recipe, and I like to use medium, peeled and deveined shrimp for convenience. I sprinkle on a delicious and smoky-spicy creole seasoning blend, and let that absorb into the shrimp for a few minutes before searing in a hot cast iron. I prepare my creamy roasted red pepper sauce in the same pan I sauteed the shrimp for extra flavor. For this deep, rich flavorful sauce, I dice up some roasted red peppers out of a jar, along with some onion and some garlic and saute those together in the pan. Then I add in some crushed tomatoes, a touch of chicken broth and the heavy cream, and simmer those together for a few minutes until just slightly thickened. As for the pasta, I like to use fettuccine for this recipe, because it’s a bit wider and a bit heartier, and stands up to the lightly creamy sauce and shrimp. Everything gets added back into the pan and tossed together just until combined allowing the flavors to mingle. I finish with a little flourish of fresh chopped parsley. 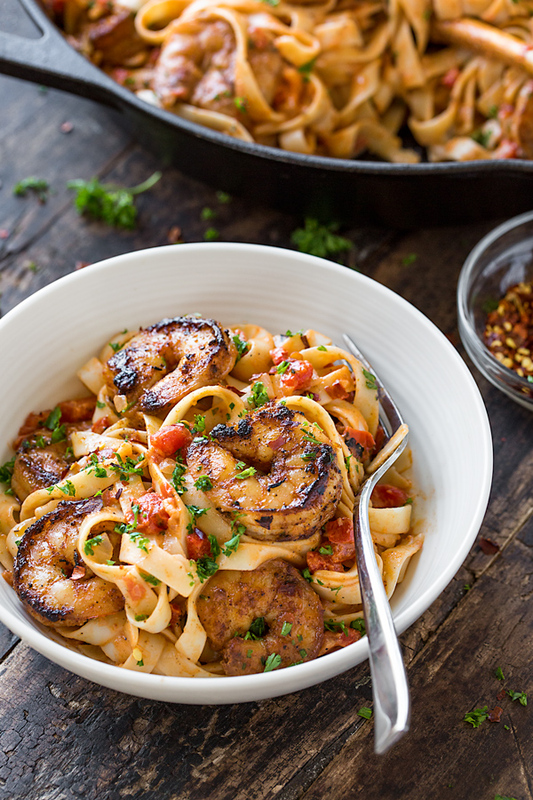 If you’re a lover of mildly spicy pasta and of creole-style cajun shrimp, then this cajun shrimp pasta is definitely one for your recipe box! Peeled and de-veined shrimp for ease: I buy fresh shrimp (or frozen shrimp, and thaw it myself) which has been peeled and de-veined and is medium-size (16/20 count). I love not having to peel it myself, and it saves a lot of time! Choice of pasta: Fettuccine pasta is my personal favorite for this type of dish, but you can also use linguine, spaghetti, bucatini, penne, or even farfalle (bow-ties). Cream or half and half: While there isn’t a huge amount cream in this recipe, if you’re trying to keep things even lighter, you can substitute half & half for the cream. The cream will have a bit more “body” and a touch more richness, but half and half is a fine option as well. 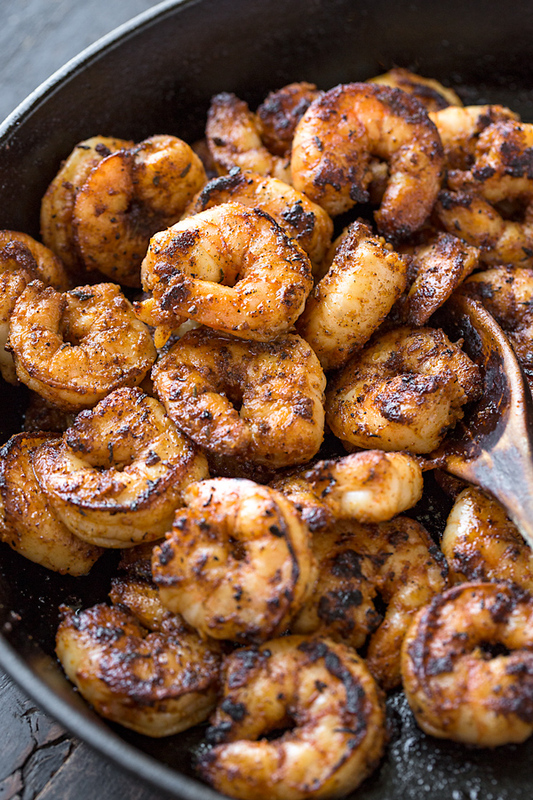 Heavy bottom pan: A large heavy-bottom pan such as a cast-iron skillet is perfect for this recipe, as you want a nice “blackened” sear or crust on the shrimp. You’ll cook your sauce in that same pan, and add back in the pasta and toss everything together before serving. This delicious cajun shrimp pasta has a flavorful and smoky “kick” from the creole seasoning and the creamy roasted red pepper sauce! –Cook the fettuccine according to the package instructions, and keep warm. –Add the shrimp to a bowl, and drizzle in about 1 tablespoon of avocado oil, and sprinkle in the cajun creole seasoning, the granulated garlic, and a pinch or two of cayenne pepper, if using; toss to coat. –Place a large cast-iron skillet over medium-high heat, and drizzle in about 2 tablespoons of the avocado oil; once hot, add the shrimp and sear it on the first side until golden-brown and crusty, about 2 minutes; flip and sear a minute or so more, until crusty on the other side; remove from the skillet and set aside. –To that same skillet add in the butter plus another small drizzle of the avocado oil if needed, and add in the diced onion along with the diced roasted red peppers, and stir; saute together for about 2-3 minutes, until softened and slightly golden. –Add in the crushed tomatoes, the chicken broth and the heavy cream and stir to incorporate, and allow the sauce to gently simmer for about 2-3 minutes just to slightly thicken; then give it a little taste to see if any additional salt is needed. –Add the cooked fettuccine into the sauce, along with about half of the shrimp plus about half of the chopped parsley, and gently toss to combine. –If serving directly from the skillet, top with the rest of the shrimp and the parsley, and serve “family style”. Or, pour the pasta into a serving dish or platter, and then top with the rest of the shrimp and sprinkle over the rest of the chopped parsley. Craving more shrimp pasta recipes? Check out this delicious Shrimp Scampi, or this Shrimp Fajita Stir-Fry! Which prepared Cajun seasoning do you use? Hi Kim, the brand that I just so happened to use was “The Spice Hunter” salt-free cajun creole seasoning blend; however, there are other brands as well, and you can use whichever you prefer. Hope you enjoy! I’m looking forward to trying this recipe! I find cooking intimidating. I only get inspired to do it when I see a recipe that looks delicious and is EASY. I have really been enjoying your blog. I find myself pinning so many recipes to try. Thank you. I am excited you’re planning on preparing this, Kim! I’m sure you will pull this off brilliantly, just put lots of love into it! ❤️ (That’s truly the big “secret” to cooking 😉.) And thank you so much for your kind words. “Camp dog” creole seasoning is about the best I have found. It has to be ordered out of Ville Platte LA. Crystal, thanks for sharing your favorite brand! Thank you so much for this wonderful recipe. I made tonight and it was delicious. Ana, thank you so much for taking a moment to share your experience with the recipe! I’m so glad that you enjoyed it! This was the absolute best new recipe we’ve tried in years! We used our own homemade “Emiril’s Creole” seasoning. It has a little salt but worked great. We’re looking forward to trying some of your other recipes. Thanks, Jim and Susan. Hi Jim and Susan, I am so very glad to read that! Wonderful! 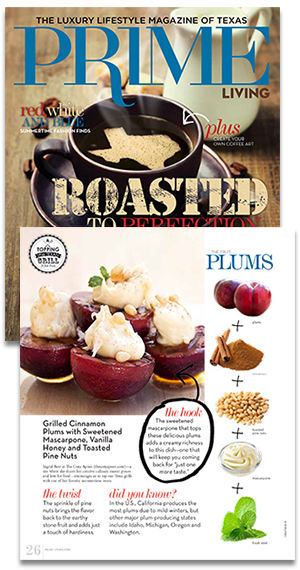 What a compliment you’ve paid, and I’m so very excited that you two will be trying more of our recipes! So glad to have you as new readers. Happy cooking…and eating, too! Thanks for sharing Jim. I have made a lot of cajun pasta in my day. This is by far the BEST! The only thing I did different was I added some chopped scallions while the sauce was cooking and some fresh ones to garnish. Other then that, I filled the recipe and it was delish! I will definately be making again! Hey Melinda, what a wonderful compliment! So glad you enjoyed this version. And the green onions are a delicious add-in. I never comment on recipe blogs/recipes I try, but I can’t not comment on this. 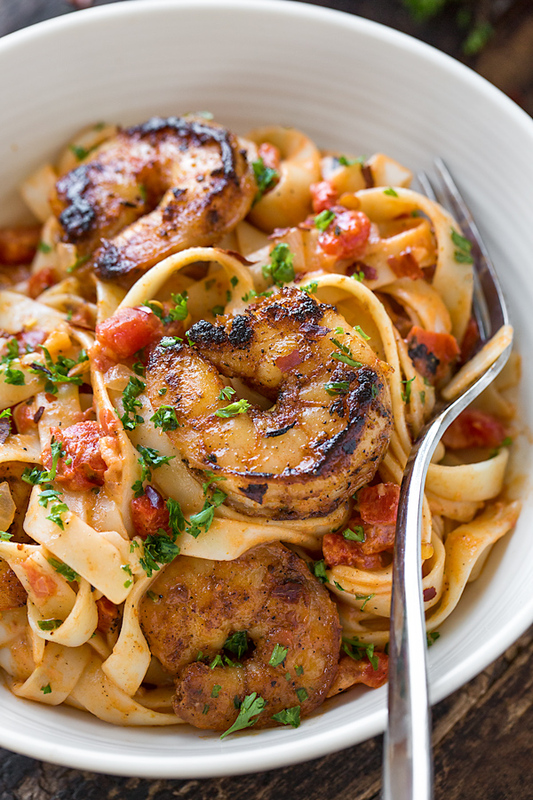 I’ve tried many Cajun pasta dishes with both chicken, shrimp, and sausage and they all fall flat. This one stands above the rest by far. We loved it, even my 7 year old who isn’t a spice fan. The only changes I made were to use some pre-chopped red pepper (frozen, leftover from another recipe) sautéed with the garlic and I didn’t measure my seasoning. (I’m terrible about that and never measure seasonings.) It ended up a bit on the spicier side, so I’ll adjust that next time. And there will be a next time because I’ve added it to my recipe collection! Thank you so much for sharing! Now I must check out more of your recipes! I’m truly honored that you and your family (especially your 7 year old who isn’t typically a fan of spice) enjoyed this dish, and that you’ve added it to your meal rotation—yay! Again, thanks for sharing this experience with me, and I hope you find some more recipes here on the site to try out. Aw, I hope you enjoy Kavinayaa! Happy 5th anniversary to you both! Delish! After a busy day of decorating the house for Christmas this was an easy and quick dish. I have also added this to my recipe collection. Definitely a keeper. I have passed this on to my brother who enjoys to cook as well. Hi Ann, so glad you enjoyed the recipe! I’m also grateful you passed along the “love” to your brother…may he find as much comfort and pleasure in it as you did! I appreciate you sharing your experience here—thanks! This recipe looks delicious! I would like to make ahead in a casserole style, freeze and serve for a dinner party. Do you have any suggestions as to how to adapt the recipe to make it just as delicious but make ahead? This is one of those dishes that is really meant to be prepared just before serving, as it is pretty quick cooking where you simply sear/saute things off in the pan, throw in the ingredients for the quick sauce, and toss cooked pasta noodles together with it. We have other pasta dishes that are more casserole style, or bakes—as a matter of fact, we have a delicious baked ziti, and a handful of lasagnas which you could prep this way; but this particular pasta is not one of them. Is the cast iron skillet required? Would love to try this but I don’t have one of those yet! Hi Kelly, no worries! Just use a heavier bottom pan, one that is on the larger side. Hope you enjoy! I made this tonight for my family and we fell in love! I have to watch my salt, so I used a Mrs. Dash salt free extra spicy blend. We are also watching carbs at dinnertime so we paired this with tofu shirataki noodles, for almost no calories or carbs. Really felt like we were indulging in a restaurant quality meal from the comfort of our own home. I added those tips in case anyone else wants to try them 🙂 thanks for an AMAZING recipe, and I will be trying more of them! Crystal, you sweetheart! Thanks for sharing your tips—they’re great! Happy cooking to you, Crystal, and I hope you find many more recipes to try out and enjoy! I made this for my boyfriend and roommate, they liked it so much they asked me to make it again for them the next day. Only difference is i freehanded with the amount of seasoning and used different proportions of shrimp, and i also added chicken. Was sooo good. Done paying for cajun pasta at restaraunts. Thank you for this pretty easy recipe! Hi Sami, I love that! So glad you all enjoyed the recipe, and I think that your addition of chicken surely made this scrumptious, offering even more protein and heartiness. Thumbs up on that! Do you think this would be good with broccoli in it? Would like to add a veggie maybe other than roasted tomatoes but not sure what pairs well with spicy pasta. I used Penzey’s Spice Cajun Seasoning. I also forgot to get the red peppers so had sun dried tomatoes (jar in oil) on hand) and they worked great! Deb, so glad you enjoyed the recipe, and way to mix things up! Made this tonight and it came out amazing. Thanks for the recipe and the easy step by step instructions. Tavia, thanks so much for sharing! So glad you enjoyed! Joe, that’s so great! Very happy to read that, and I thank you for sharing your experience with me! Absolutely delish! A hit w my three boys. Wonderful job, momma! So very glad to read that. Thanks so much for sharing that with me Shelly! I am wicked full and it’s all your fault, Ingrid! This was such a delicious recipe, thank you so much for sharing. Definitely one that I will be making again and again. I will even up the heat next time since to my husband and I, it was only mildly spicy even though I added both the cayenne and crushed red pepper. I’m going to read more of your recipes now! So very glad you and your hubby enjoyed the pasta, and yes—up that heat! I love mine nice and spicy too, and adding more spice is always a good thing when you can handle it. I hope you find more tasty recipes to prepare and be nourished by! Happy to cooking to you! I just made this tonight for my husband and I, and I doubled the measurements so we had meals for our work day tomorrow. The only thing I changed was heavy cream for coconut cream. It added a different dimension! He’s dairy intolerant. He’s very stoked and so am I! Thank you so much for this recipe! It is fantastic! Hi Monique, I loved reading that! It touches me to know you both will be enjoying the leftovers for work tomorrow, gaining more comfort and nourishment from the recipe. I think the substitution of coconut cream for your dietary needs is such an interesting one, and I’m glad that the flavor was still just as tasty. Way to get creative! Thanks so much for sharing your experience with me, and I hope you find more recipes off the site to enjoy together! I made this and threw in some little neck clams last minute. Amazing!!! Deanna, those sound like a genius addition! 😉 How tasty! Perhaps you will inspire others to try that out, so I thank you for sharing. So glad you enjoyed the recipe! 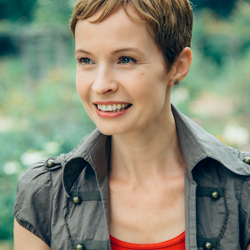 Joy, thank you so much for sharing your experience with me—it put such a smile on my face!